In codelab MDC-103, you customized the color, elevation, typography, and shape of Material Components (MDC) to style your app. A component in the Material Design system performs a set of predefined tasks and has certain characteristics, like a button. However, a button is more than just a way for a user to perform an action, it's also a visual expression of shape, size, and color that lets the user know that it's interactive, and that something will happen upon touch or click. The Material Design guidelines describe components from a designer's point of view. They describe a wide range of basic functions available across platforms, as well as the anatomic elements that make up each component. For instance, a backdrop contains a back layer and its content, the front layer and its content, motion rules, and display options. Each of these components can be customized for each app's needs, use cases, and content. These pieces are, for the most part, traditional views, controls, and functions from your platform's SDK. While the Material Design guidelines name many components, not all of them are good candidates for reusable code and therefore aren't found in MDC. You can create these experiences yourself to achieve a customized style for your app, all using traditional code. This is the last of 4 codelabs that guide you through building an app for a product called Shrine. We recommend that you do all of the codelabs in order as they progress through tasks step-by-step. MDC-102: Material Design Structure and Layout. If you completed MDC-103, your code should be ready for this codelab. Skip to step: Add the backdrop menu. The starter app is located in the material-components-flutter-codelabs-104-starter_and_103-complete/mdc_100_series directory. To see the completed code, checkout the 104-complete branch. A backdrop appears behind all other content and components. It's composed of two layers: a back layer (that displays actions and filters) and a front layer (that displays content). You can use a backdrop to display interactive information and actions, such as navigation or content filters. The HomePage widget will be the content of our front layer. Right now it has an app bar. We'll move the app bar to the back layer and the HomePage will only include the AsymmetricView. Create a widget called Backdrop that includes the frontLayer and the backLayer. The backLayer includes a menu that allows you to select a category to filter the list (currentCategory). Since we want the menu selection to persist, we'll make Backdrop a stateful widget. Import the meta package to mark the properties @required. This is a best practice when you have properties in the constructor that have no default value and cannot be null and therefore should not be forgotten. Notice that we also have asserts after the constructor that check the values passed into those fields are indeed not null. The build() function returns a Scaffold with an app bar just like HomePage used to. But the body of the Scaffold is a Stack. A Stack's children can overlap. Each child's size and location is specified relative to the Stack's parent. Now add a Backdrop instance to ShrineApp. The backLayer shows the pink area in a new layer behind the frontLayer home page. You can now adjust the design and content of the two layers. In this step, you'll style the front layer to add a cut in the upper left corner. Material Design refers to this type of customization as a shape. Material surfaces can have arbitrary shapes. Shapes add emphasis and style to surfaces and can be used to express branding. Ordinary rectangular shapes can be customized with curved or angled corners and edges, and any number of sides. They can be symmetrical or irregular. The angled Shrine logo inspired the shape story for the Shrine app. The shape story is the common use of shapes that are applied throughout an app. For example, the logo shape is echoed in the login page elements that have shape applied to them. In this step, you'll style the front layer with an angled cut in the upper-left corner. We've given Shrine's primary surface a custom shape. Because of the surface elevation, users can see that there is something just behind the front white layer. Let's add motion so that users can see the backdrop's back layer. Motion is a way to bring your app to life. It can be big and dramatic, subtle and minimal, or anywhere in between. But keep in mind that the type of motion you use should be suitable to the situation. Motion that's applied to repeated, regular actions should be small and subtle, so that the actions don't distract the user or take up too much time on a regular basis. But there are appropriate situations, like the first time a user opens an app, that can be more eye-catching, and some animations can help educate the user about how to use your app. The initState() method is only called once, before the widget is part of its render tree. The dispose() method is also only called once, when the widget is removed from its tree for good. The AnimationController coordinates Animations and gives you API to play, reverse, and stop the animation. Now we need functions that make it move. Wrap the backLayer in an ExcludeSemantics widget. This widget will exclude the backLayer's menu items from the semantics tree when the back layer isn't visible. We've delayed the build of the front/back layer stack until layout time using LayoutBuilder so that we can incorporate the backdrop's actual overall height. LayoutBuilder is a special widget whose builder callback provides size constraints. The widget tree performs layout by traversing towards the leaves. Constraints are passed down the tree but sizes usually aren't calculated until the leaf returns its size based on the constraints. If a leaf needed to know its parent's size, it couldn't since it's not yet calculated. LayoutBuilder is used when a widget must know its parent widget's size in order to lay itself out (and the parent size does not depend on the child.) LayoutBuilder takes a function that returns a Widget. For more information, see the LayoutBuilder class documentation. In the build() function, turn the leading menu icon in the app bar into an IconButton and use it to toggle the visibility of the front layer when the button is tapped. Reload then tap the menu button in the simulator. The front layer animates (slides) down. But if you look down, there's a red error and an overflow error. This is because the AsymmetricView is squeezed and becomes smaller by this animation, which in turn gives less room to the Columns. Eventually, the Columns can't lay themselves out with the space given and they result in an error. If we replace the Columns with ListViews, the column size should remain as they animate. The Column includes MainAxisAlignment.end. To begin the layout from the bottom, mark reverse: true. The order of the children is reversed to compensate for the change. Reload and then tap the menu button. The gray overflow warning on OneProductCardColumn is gone! Now let's fix the other. We also added some safety to imageAspectRatio. Reload. Then tap the menu button. A menu is a list of tappable text items that notify listeners when the text items are touched. In this step, you'll add a category filtering menu. Add the menu to the front layer and the interactive buttons to the back layer. It's a GestureDetector wrapping a Column whose children are the category names. An underline is used to indicate the selected category. In app.dart, convert the ShrineApp widget from stateless to stateful. Press alt (option) + enter. Change the ShrineAppState class to private (_ShrineAppState). 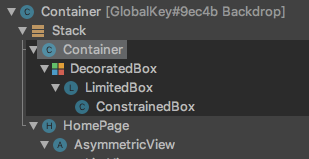 To do this from the IDE main menu, select Refactor > Rename. Alternatively, from within the code, you can highlight the class name, ShrineAppState, then right-click and select Refactor > Rename. Enter _ShrineAppState to make the class private. Then change the back layer to a CategoryMenuPage. In the build() function, change the backlayer field to CategoryMenuPage and the currentCategory field to take the instance variable. If you tap a menu option, nothing happens...yet. Let's fix that. In home.dart, add a variable for Category and pass it to the AsymmetricView. In app.dart, pass the _currentCategory for frontLayer:. Reload. Tap the menu button in the simulator and select a Category. Tap the menu icon to view the products. They're filtered! Hot reload then tap the menu icon and select a category. The menu should close automatically and your should see the category of items selected. Now you'll add that functionality to the front layer too. Then add a GestureDetector to the _FrontLayer's child: Column's children:. Reload and then tap on the top of the front layer. The layer should open and close each time you tap the top of the front layer. Branded iconography extends to familiar icons too. Let's make the reveal icon custom and merge it with our title for a unique, branded look. In backdrop.dart, create a new class _BackdropTitle. // Here, we do a custom cross fade between backTitle and frontTitle. // This makes a smooth animation between the two texts. The _BackdropTitle is a custom widget that will replace the plain Text widget for the AppBar widget's title parameter. It has an animated menu icon and animated transitions between the front title and back title. The animated menu icon will use a new asset. The reference to the new slanted_menu.png must be added to the pubspec.yaml. The branded icon is created in the _BackdropTitle. It contains a Stack of animated icons: a slanted menu and a diamond, which is wrapped in an IconButton so that it can be pressed. The IconButton is then wrapped in a SizedBox in order to make room for the horizontal icon motion. Flutter's "everything is a widget" architecture allows the layout of the default AppBar to be altered without having to create an entirely new custom AppBar widget. The title parameter, which is originally a Text widget, can be replaced with a more complex _BackdropTitle. Since the _BackdropTitle also includes the custom icon, it takes the place of the leading property, which can be now be omitted. This simple widget substitution is accomplished without changing any of the other parameters, such as the action icons, which continue to function on their own. In backdrop.dart,add a shortcut back to the login screen from the two trailing icons in the app bar: Change the semantic labels of the icons to reflect their new purpose. Reload the app and tap the search or tune buttons to return to the login screen. Over the course of these four codelabs, you've seen how to use Material Components to build unique, elegant user experiences that express brand personality and style. The completed MDC-104 app is available in the 104-complete branch. This codelab, MDC-104, completes this sequence of codelabs. You can explore even more components in MDC-Flutter by visiting the Flutter Widgets Catalog. For a stretch goal, try replacing the branded icon with an AnimatedIcon. To learn how to connect an app to Firebase for a working backend, see the codelab Firebase for Flutter.